If you often reply to the same customer questions, consider saving those replies as canned responses. It will shorten your response times and save keystrokes on repetitive typing. 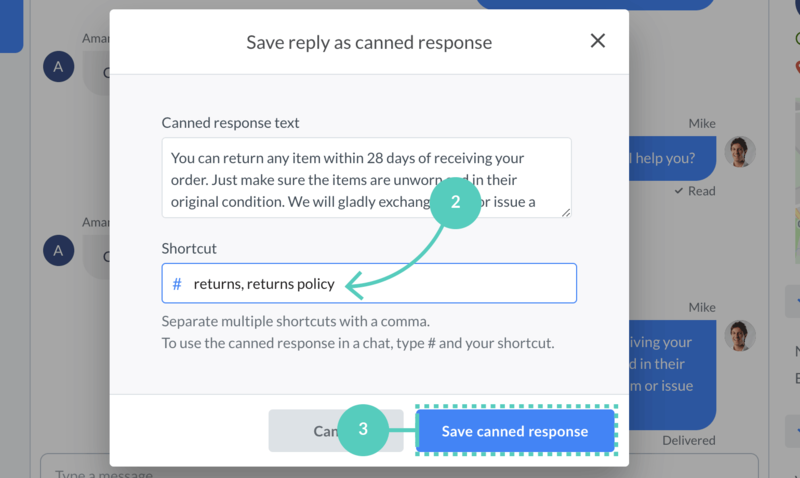 With canned responses, you type it once, save it and reuse it in chats and tickets whenever you need. Apart from being a huge time saver, canned responses help tackle typo mistakes. Use them for foreign names, complex addresses, common expressions, URLs or virtually anything that you type repeatedly. Customers love instant replies – make sure your typing speed is on point with our typing speed test. To use a canned response in chat, type in the hash sign followed by a shortcut, for example, #thank (try it out!). We created a separate article where you can find more examples and tips&tricks regarding this feature. If you find yourself sending the same reply yet another time, you can save it with just one click. After replying to the customer’s question, hover your mouse over your message and click the Save as canned response icon. You will see a pop-up window in which you can edit the message and add a shortcut. To add more shortcuts at once, separate them with a comma. Finally, to keep changes, hit Save canned response. If you have several groups, such as sales and support, and you save a canned response during a chat, it will be assigned to the group in which the chat occurred. To begin, go to Settings → Agent tools → Canned responses. Then, enter the canned response text. Click Add this response button to save it. When sending a predefined response, personalize it with the customer’s name. Also try tweaking the template a little bit each time so that you don’t sound robotic. First, go to Canned responses. Find the response you want to edit, hover your cursor over it and click edit. Here, you can change the text of the response. Click on Save changes to finish up. Navigate to Canned responses and find the response you want to delete. Hover your cursor over it and click delete. Finalize by clicking on the Delete this response button. If you have your agents assigned to different groups you can create canned responses that are group-specific. You will find a required canned response quicker when you narrow down the results to a single group rather than having to search through the entire list. If you have yet to create groups and assign agents to them, check out our article about groups. Go to Settings → Agent tools → Canned responses. In the upper left corner, click on the group dropdown menu. Then find and choose the group you want to assign the canned response to. Fill in the canned message text field. Click on the Add the response button to save it. When a canned response is assigned to a specific group, only agents from the specific group will be able to use this response. When you are using this method, the pool of predefined responses available for all departments remains relatively small and your teammates can find relevant responses faster.